If there’s any team to get back on track against, it’s the Rangers. Texas was 18-30 when they welcomed the Yankees into town and lost their 31st game pretty quickly. Gary Sanchez (two-run) and Giancarlo Stanton (grand slam) delivered the big blows in an 8-2 victory. Masahiro Tanaka was excellent, allowing just one run in seven frames. 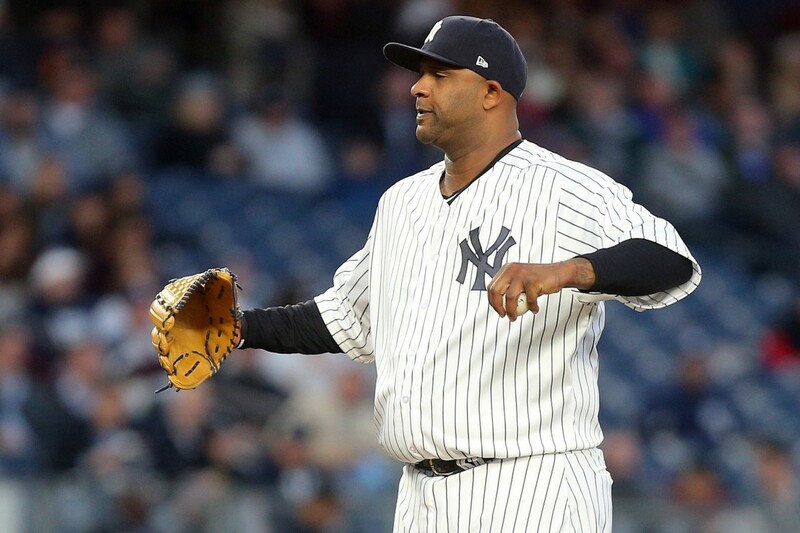 Game two might have been a confidence booster for the struggling CC Sabathia. The southpaw threw six innings of one-run ball, lowering his ERA to a still too high 7.89. The offense exploded again, hitting six doubles and scoring six runs in the 6-3 win. Prior to the series’ third game, Greg Bird’s rehab assignment time ran out. Similar to real life, Ronald Torreyes was the odd man out to make room for Bird. Tyler Austin, with a 160 OPS+, has simply been too good to move down. Meanwhile, Torreyes only had 29 plate appearances and just didn’t have much of a role. Bird didn’t start in his first game back on the roster, as lefty Cole Hamels started for Texas. Unfortunately, a sweep wasn’t meant to be as Jordan Montgomery dug the Yankees a deep hole right away. He surrendered four runs in the first inning and another in the fourth before being pulled. Hamels and the Rangers’ bullpen were solid, not allowing one extra-base hit. The final score was 8-2. The first game of the homestand was rained out, setting up a Saturday doubleheader. Of course, the first game of the doubleheader went to extras. A 1-1 deadlock and pitchers duel started by Tyler Skaggs and Luis Severino became a battle of the bullpens, and the Yankees ‘pen gave out first. Chad Green, in his third frame of work, allowed a run in the twelfth which was the difference, as the Angels held on, 2-1. After the game, the Yankees optioned Tyler Wade to Triple-A in order to get another pitcher on the roster. Luis Cessa was summoned. 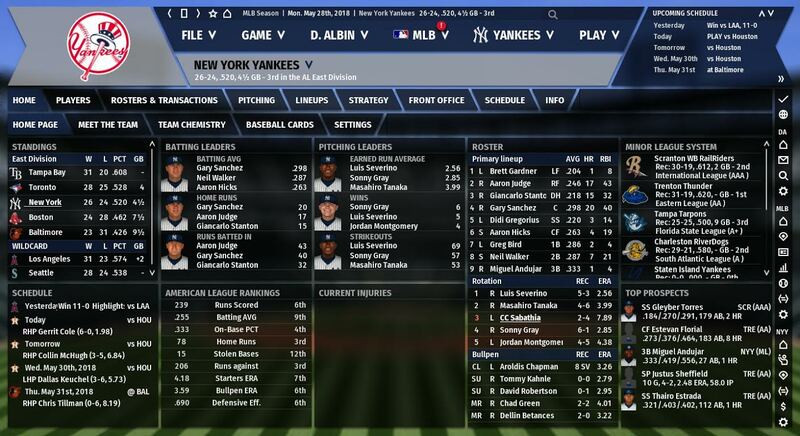 It’s too bad that virtual Sonny Gray and real-life Sonny Gray can’t trade places. In game two, Gray dropped his ERA to 2.85 with six and a third shutout frames. It was an easy win, as the Yankees blasted four homers, including Greg Bird’s first. The final score was 8-0. The rubber game gave the virtual universe what everyone wanted in reality: a pitching matchup of Masahiro Tanaka vs. Shohei Ohtani. The problem was that it didn’t turn out to be much of a duel. The Yankees routed Ohtani and knocked him out in the second inning. The rookie two-way player gave up nine runs in an inning and a third, while his counterpart, Tanaka, pitched a gem. Tanaka delivered seven blank innings while Luis Cessa tossed clean eighth and ninth innings. The final score: 11-0 Yankees. Finally, a good week of baseball for the parallel universe Bombers. The Yankees won both of this week’s series, one in Texas and one at home vs. the Angels, to go 4-2. Aside from a winning week, there were a handful of positives that were much needed. CC Sabathia finally had a good start, Greg Bird returned, Masahiro Tanaka delivered two strong performances, the offense hit home runs aplenty, and Sonny Gray continued to pitch well. To cap off a big week, the Yankees battered Shohei Ohtani and knocked him out in the second inning of Sunday’s finale. That game featured the much anticipated Ohtani vs. Tanaka matchup that everyone wanted in reality, though it didn’t turn out to be the pitchers duel that the virtual masses hoped for. Episode 147: Trade for Cole Hamels?